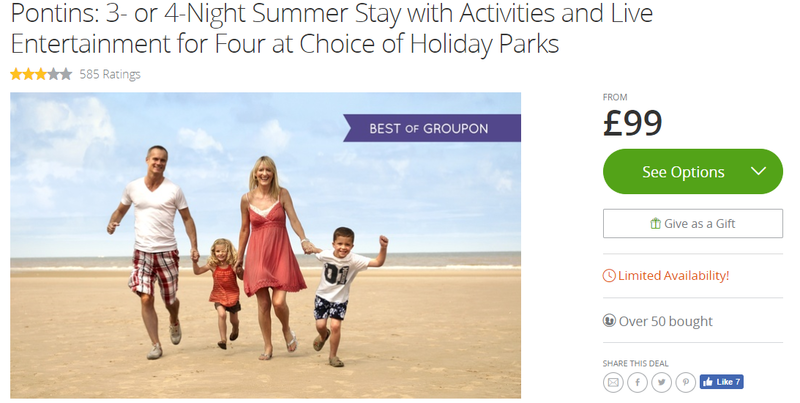 If you’re looking for a cheap getaway with the family then there are some great deals over at Groupon like these 3 and 4 night breaks to Pontins over the summer period from as little as £99 per Family. Pontins invites holidaymakers for a fun-packed summer break during school summer holidays, with lots of activities and live entertainment every evening. All the parks are situated on the coast so the sea and beaches can be easily accessed. The programme includes indoor and outdoor daytime activities and evening entertainment including performances from The Sooty Show, Ricky K, Yes Lad, X Factors Reggie n Bollie, 4th Impact & Ryan Lawrie and appearances from kids’ TV favourties. Facilities such as play areas, go-karts, skate parks, trampolines, crazy golf and heated indoor swimming pools are available at the parks. Restaurants, takeaways and bars are on site to ensure a hassle-free holiday for those who prefer a break from cooking.